Amber lays out a heat-safe board on a table in the middle of the Bramble Berry studio. She sets a pancake griddle with cat food cans of colorful waxes on top of it and a places a blowtorch next to it. As the griddle begins to heat up, she invites the six resident soapmakers to gather round to learn how to paint with wax. Amber shows off resin crystals. These are mixed with the wax and allow it to be more translucent and durable and prevents a white cloud from developing on the surface. Amber's brushes sit in repurposed cat food tins on top of a griddle. As the griddle warms, the wax melts. The Greeks practiced encaustic painting as early as the 5th century BCE. They used it to paint portraits and mythology on panels, to color marble statues and to weatherproof and decorate ships. Soon the Egyptians and Romans adopted the medium. For a few years now, Amber has been using Bramble Berry beeswax, powdered oxides and ultramarines and a blowtorch to paint. She strategizes the marketing for Bramble Berry, but she studied fine art in school. Her brushes are covered in clumps of colored wax. The wax melts as the griddle heats up. The clumps start to slide off. Amber, Bramble Berry's chief marketing officer, demonstrates how to use the blow torch. 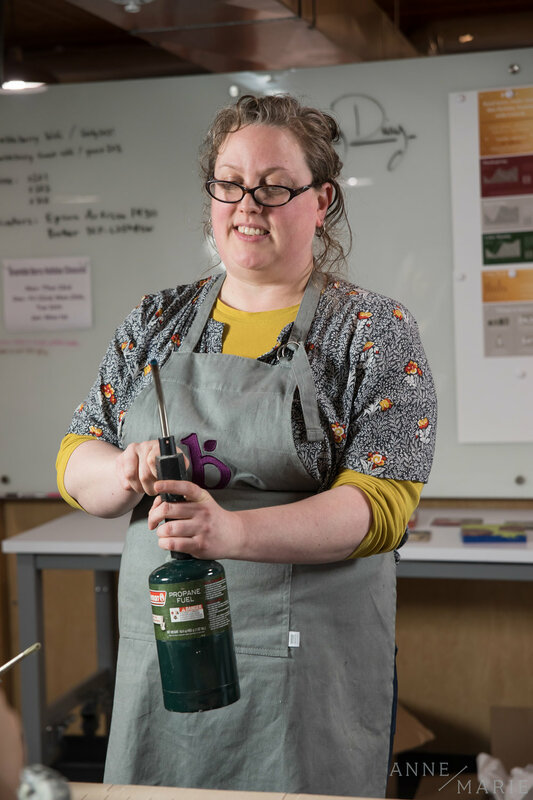 Amber demonstrates how to fuse layers of wax together using the blow torch. The torch needed to be used after each layer. Anne-Marie used a shade of pink for her first layer. (From left to right) Anne-Marie, Kelsey and Kayla start their encaustic projects. Anne-Marie fuses her layers with the blow torch. She grabs a brush and paints a base layer across an art board. It’s important to fuse the layers of wax together, she says as she picks up the blow torch. She twists the nozzle. “Turn until you can hear it hiss,” she says. Amber twists the nozzle till the flame mellows and shrinks in size. She sweeps the flame across the board, melting the wax layers together. “So who’s ready?” she asks. After quickly noting where the fire extinguishers are located, everyone jumps in. 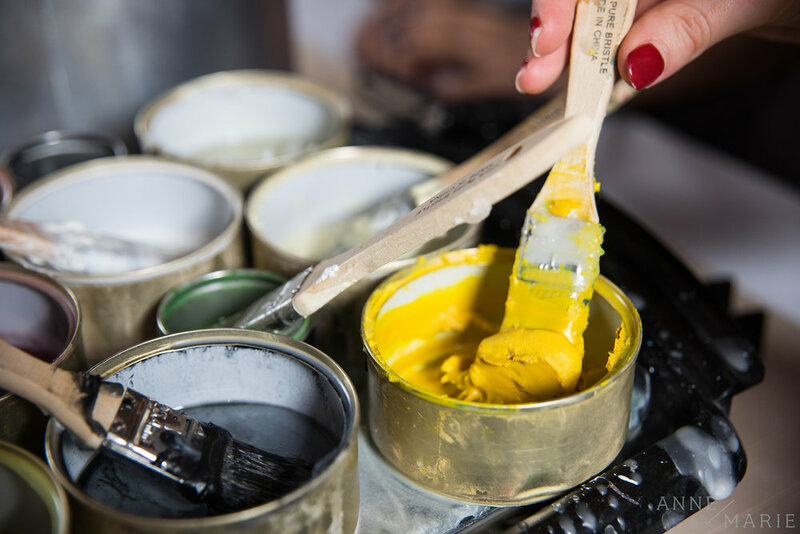 The tins of colored waxes are mostly melted, with one brush per tin. Kelsey, the editorial director, reaches for dark hues for a night sky. Anne-Marie reaches for a shade of Bramble Berry pink, thinking she could decorate her office. 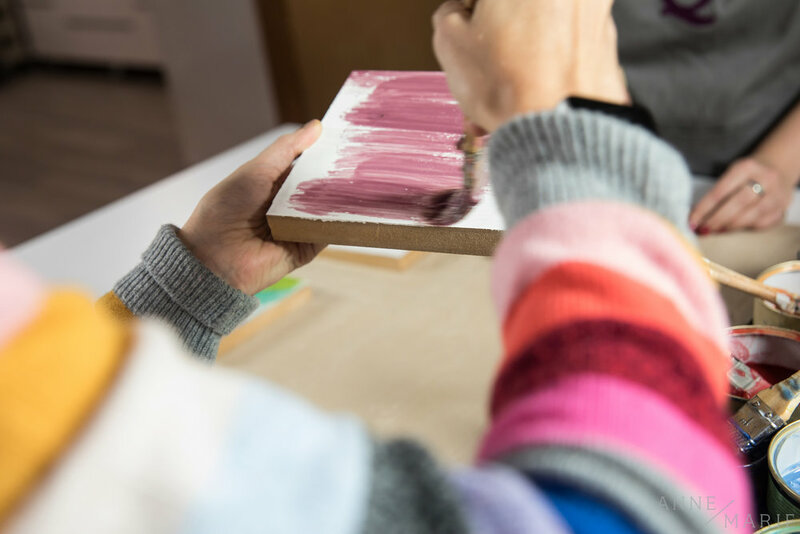 After each layer of paint, the layers have to be fused with the blowtorch. Kelsey grabs the torch, twists the nozzle and brushes the flame across her art board. Others are more hesitant. Kelsey fuses her layers with the blow torch. If the flame was too hot, more than just the top layer could be melted causing pigments to mix together. Etching designs into the wax and then painting over it created interesting textures. Photos could also be added and painted over to create collages. “Like this?” Anne-Marie asks as she twists the nozzle of the blow torch. “Turn it more,” Amber says. Anne-Marie twists the nozzle. Suddenly a large flame bursts from the torch. Anne-Marie shrieks as she frantically twists the nozzle back the other way to calm the flame. Finally the blue flame is just right for Anne-Marie’s layers to fuse. “I like that you can redo everything and nothing is ever final,” Anne-Marie says. Everyone's projects look different. Some are thick layers of wax with designs etched in, other projects cover images in wax to create collages, and some are abstract designs. The torch is passed around and the layers of wax are built. The flame and the wax become unpredictable. Sometimes the pigments move and blur together when the torch hit them. The plans and visions for each piece quickly give way to something more primary. 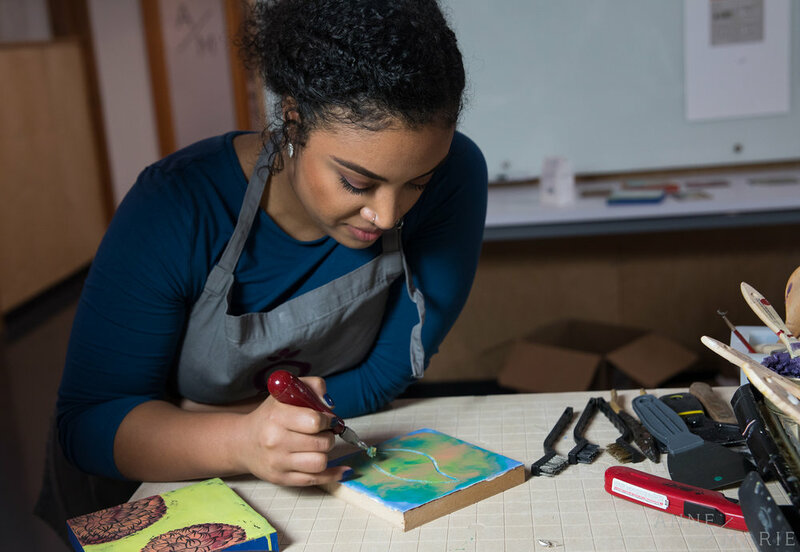 “You should experiment with new crafts, even if they are difficult or uncomfortable because they open your eyes to ways to experiment within your current craft,” Anne-Marie says. Kayla, Bramble Berry's marketing coordinator, etches a leaf into her wax. (From left to right) Kayla etches a design while Amanda, Bramble Berry's creative director, fuses her layers. The heat-safe board created a safe place to work with fire and hot wax. Everyone's projects turned out differently. Despite how frustrating it feels when the flame moves a layer or when skill doesn’t match vision, this endeavor still manages to be fun and exciting.